The MyScript Calculator app for iPhone, iPod Touch, and iPad solves math problems and equations that you write with your finger or stylus. It supports an incredible range of functions including addition, subtraction, multiplication, and division calculus, trigonometry, percentages, square roots, exponents, and parenthetical equations. This is an excellent tool to help your kids with their homework, as well as complete home improvement project calculations. 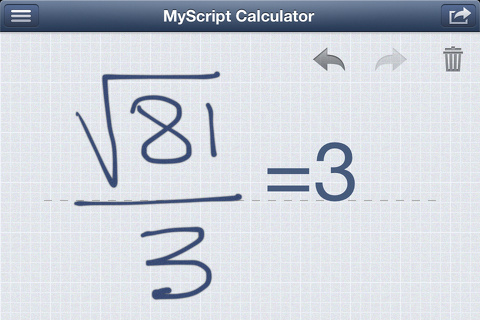 The MyScript Calculator iPhone app has simple, clear navigation and functionality. You don’t have to sort through the symbols on your iPhone’s keyboard. You simply touch the screen and write your math problem. The solution is automatically displayed on the screen. It is just that simple. If you want to go back a step, you press the back arrow at the top right hand corner. If you want to move forward, then you press the forward icon. When you have completed your problem, you can share it to Twitter and email, as well as copy to clipboard. You simply touch the trash can to delete and start a new problem. The gesture controls are agile, responsive, and accurate. It is a great tool to help you quickly help your children with homework. The MyScript Calculator iPhone app is interesting enough that your kids can check their own homework by plugging in their math problems. It is impressive that calculus and trigonometry are supported to help your kids in middle and high school. The simple tools are also great to have for home improvement projects. You can complete calculations and email them for you to consult at the home improvement store. The MyScript Calculator iPhone, iPod Touch, and iPad app is surprisingly free. It is a great resource easily worth a few bucks. 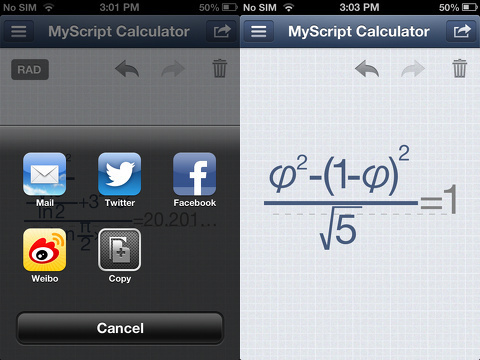 AppSafari review of MyScript Calculator was written by Jenni Ward on January 4th, 2013 and categorized under App Store, Education, Free, iPad apps, Kids, Productivity, Reference, Universal, Utilities. Page viewed 5642 times, 1 so far today. Need help on using these apps? Please read the Help Page.